The WPH is excited to present the WPH No Frills event in Tucson on Saturday and Sunday, January 10th and 11th at the Tucson Racquet Club. The No Frills will serve as a pre-Houston Race 4 Eight tune-up up for many of the top Race 4 Eight stars as they prepare for the upcoming stretch of the Race 4 Eight IV events in Houston, San Francisco, New York, and Salt Lake City between the end of January and the middle of April. The No Frills will also feature a special pro-am doubles, junior singles, and 120+ doubles. The pro-am doubles teams a pro player with a non-pro player in a once in a lifetime opportunity for amateurs to play alongside and against their pro heroes in tournament action. 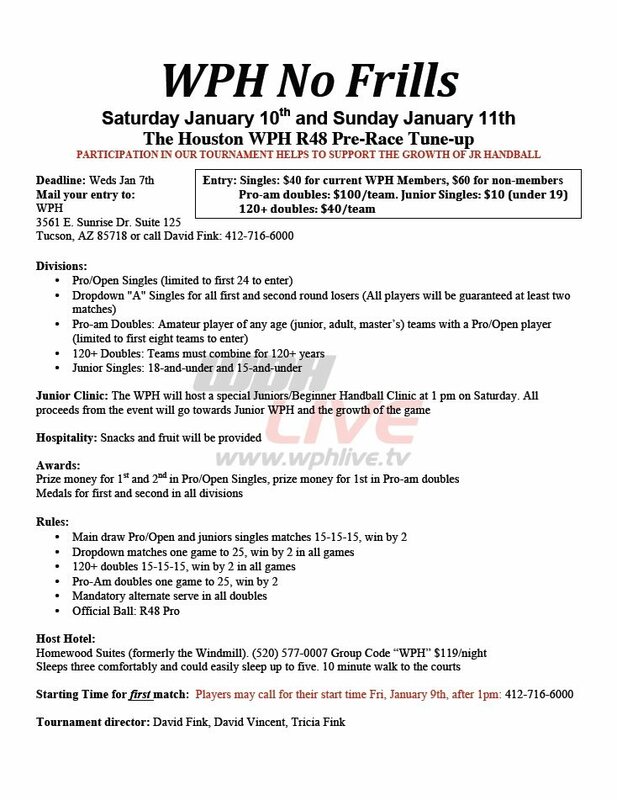 Junior singles features 18-and-under and 15-and-under divisions and the unique 120+ doubles requires teams to combine for a minimum of 120 years. Make your plans now to play in the first premiere event of 2015!